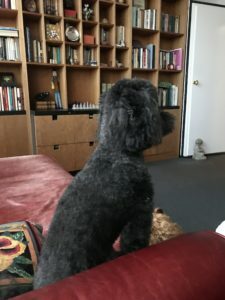 As a miniature poodle who works with my foster parents, psychoanalysts Arnold Richards and Arlene Kramer Richards, I welcome you to many stories about dogs in the offices of psychoanalysts and psychotherapists. Nancy Goodman invited me to be curator of this Gallery in order to honor the special place of canines with patients—beginning with Sigmund Freud’s Chou. She also asked Arnie and Arlene to tell a lot of stories about me. This is a little embarrassing but I am told that I am inspirational and especially attuned to the unconscious and to longings for attachment. 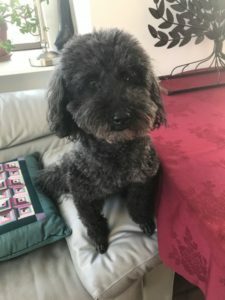 Nancy says that dogs can represent many symbolic aspects of the psyche but most of all answer the quest for love of so many people who come to psychoanalysts. I hope you enjoy and learn from Travels with Winnie and Psychoanalysis. John Steinbeck had a good appreciation of us dogs and here are some quotes from his book Travels with Charlie. A dog is a bond between strangers. I need a dog pretty badly. I dreamed of dogs last night. They sat in a circle and looked at me and I wanted all of them. I’ve seen a look in dogs’ eyes, a quickly vanishing look of amazed contempt, and I am convinced that dogs think humans are nuts. It is my experience that in some areas Charley is more intelligent that I am, but in others he is abysmally ignorant. He can’t read, can’t drive a car, and has no grasp of mathematics. But in his own field of endeavor, which he is now practicing, the slow, imperial smelling over and anointing on an area, he has no peer. Of course his horizons are limited, but how wide are mine? 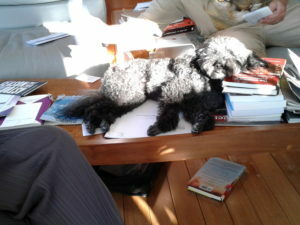 I enjoy lying in the sun and reading all the books Arnie and Arlene leave around.